On the afternoon of Sunday April 24, 1932, a group of approximately five hundred men and women set out for the summit of Kinder Scout, the highest point in Derbyshire's Peak District. They were not here to take in the fresh air and breathtaking vistas: they were here to make a stand. Kinder Scout, like almost every other site of natural beauty in Britain at that time, was privately owned and fiercely guarded. This wild, open landscape was one that they had absolutely no right to visit. 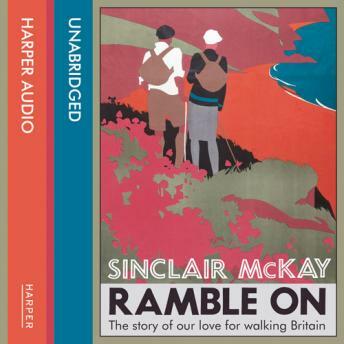 Ramble On tells the story of how country walks and rambling were transformed from a small and often illegal pastime to the most popular recreational activity in the country. But the story of rambling is not so much about parliamentary acts as it is about the remarkable people who campaigned for (and in some cases against) the pastime. There was a Lancastrian town council accountant called Alfred Wainwright, who in the 1950s changed his life, and the lives of many others, when he popularised walking in the Lake District with his series of guides. And any history of rambling would be incomplete without mentioning the resistant landowners - from the notorious Nicholas Van Hoogstraten to celebrities such as Madonna and Jeremy Clarkson - who have done their level best (and worst) to keep walkers off their land. Above all, this tale is about the exhilaration of a gusty hill-top path; the curious unease that a labyrinthine dark forest floor can induce; the feel of different soil, peat and rock; the sight of alternating sunlight and shadow sweeping across vast valleys. Both a biography of Britain's favourite outdoor pursuit and a celebration of our wonderful countryside, Ramble On is for anyone who has ever pulled on a pair of walking boots or is partial to the taste of Kendal mintcake.